It’s always disturbing – frightening, really – when civil servants who are permitted to carry weapons and to deprive others of their liberty show disdain for the law, let alone for the rules of decency and common sense. Police officials seem to be handling revelations of an apparent police attack on a subdued suspect firmly and appropriately. Six police officers were put on leave soon after video of the April 19 incident became public. In the video, the handcuffed suspect, 22-year-old John T. Willet, is slapped and kicked. He can be heard pleading with police to stop kicking and stomping him. Police officials have provided information to the offices of both the U.S. Attorney and the Erie County District Attorney. They should pursue the case aggressively. The story played out this way: At 10:30 p.m. April 19, police saw a speeding car in the city’s Riverside section. Willet, the driver, stopped the car and fled. Police gave chase and say that when they caught him, they found heroin, crack cocaine and marijuana. Willet was handcuffed and on the ground and, judging from the video, was beaten by one police officer while others stood by, doing nothing to stop the officer. It’s no surprise that at least a few cops are bad and that some boil over with anger or frustration. Like the rest of us, they’re only human. Unlike the rest of us, though, they are daily faced with some of the most difficult work imaginable. Virtually always, they are dealing with people at their worst: nasty specimens who prey on others or solid people who are in crisis. That cops can develop an us-against-them attitude is predictable and even understandable. But it can’t be allowed to rule their actions. That’s why training and clear expectations are so important. There is an understanding between police and the communities they serve. Police are granted special authority and, under certain circumstances, are empowered even to take a life. In exchange, they must live by rules that must accompany extraordinary authority. If they don’t, the consequences have to be severe. Police cannot use unnecessary force against suspects. It doesn’t matter that they may have been provoked or that they are at the end of a difficult shift. In the age when millions of people carry phones and tablets that record sound and video, and when YouTube is available to share those images with the world, common sense should tell police – and others who believe they are operating anonymously – that their cover has been blown. It’s a different world. NFTA police learned that lesson – or one hopes they did – in 2011 when someone recorded video of a cop pepper-spraying a war protester who had the right to be where he was. An angry judge cleared the victim, Nate Buckley, of all charges, and Buckley is now suing the department. 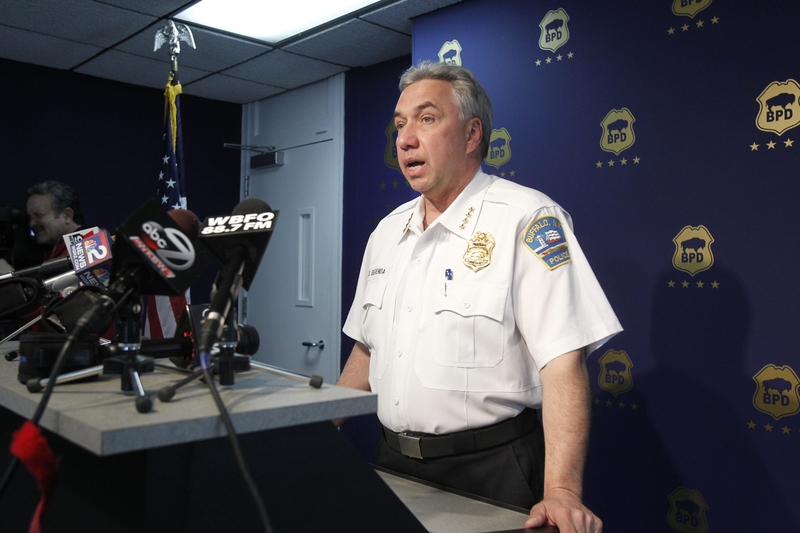 If the Willet incident reflects a culture within the Buffalo Police Department, then it is necessary to wonder what else is going on that residents are never made aware of. If it is just these few officers, then we are fortunate that someone was present to capture this revolting event on camera. Either way, cops are prone to the same failings as the rest of us. That’s when their training, not their frustration, needs to take over when they come under pressure. And, just like anyone else with great authority, they need to be watched.